So, lovely people, this is where you come in – please sponsor me to shave off my remaining facial hair and grow a top lip adornment that will look ridiculous no matter what ‘style’ I ‘choose’ to ‘grow’. You can get to my currently quite empty MoSpace (I still hate the abbreviation Mo) by clicking here, and therein donate monies in either my name or that of my team, the Whisky4Movember of the post title. 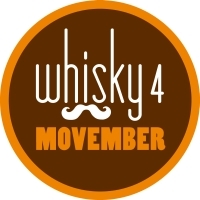 Yet again Whisky4Movember team captain Mr ‘The Whisky Guy’ Rook has done some sterling work and with the chaps at Master of Malt has managed to get a cask of whisky from Glenfarclas, which is bottled and will have the profits donated to the charity. If you’re around in London there’s a bottle behind the bar at the excellent Worship Street Whistling Shop for you to go and have a freebie taste of if you ask nicely. Along with that Whisky Squad, London’s friendliest and most casual regular whisky tasting group (as the slogan is rapidly crystallising into), is running a bonus Whisky4Movember tasting on November 22nd (the day before my blog’s birthday…hmm…) and there are a still a few tickets left – book now!. At 22 days in there will be some people whose faces will be ripe for laughing at. There is also talk of other things, with Darren throwing whisky around at a bunch of the events that are going on through the month and may be a team appearance at the Battersea park fun run if a) it goes ahead this year and b) if any of us can be motivated to both get up early enough and then also run around a park. We’ll see. Anyways, donate early; donate often.